Even if many of you have already heard about them, today we would like to officially introduce HyperFair, the new stat up that is taking part to the 2010 Gym Program at Pier 38. HyperFair, thanks to a proprietary web-based 3D platform, revolutionizes the way of making trade fairs, organizing and managing turnkey virtual exhibitions on the web. 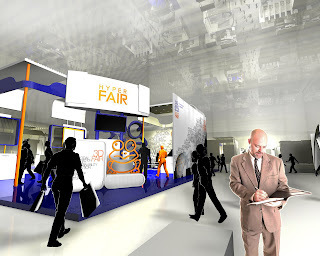 HyperFair reproduces the trade fair environment just as we all know it: pavilions, booths, workshops and conferences. Inside the virtual fair real people in real time are moving around, interacting through their avatar and communicating via chat and video call. Exhibitors can choose their stand and customize it adding 3D products, brochures, video and any interactive content. Visitors can exchange information, view the products and download documents from the comfort and convenience of their home or office. HyperFair (www.hyperfair.com) was founded in December 2009 by Marco Campanari (CEO) and Massimiliano Bonfanti (executive VP). The Company holds a qualified technological partnership with the Politecnico of Milan University, and is being hosted by the University incubator managed by the "Politecnico of Milan” Foundation. The operations in the U.S. are carried out by Andrea Ballarini (COO) who is also leading the strategies of the Company. HyperFair has completed the development of the technology and in November will show up to the market during the Virtual Transpotec. Next appointment will be in December during the Hip Expo, the first online fair dedicated to halal food products. (www.hyperfair.com/eng/eventi/eventi.html). We asked Marco how the project started and which are their plans for the future. That’s what he answered: “We officially started up HyperFair in Italy on December 2009, but we have been working on it since the beginning of 2009. Massimiliano and I were looking for a new technology that could significantly impact the business community and we came up with this ground-breaking idea by developing our own innovative technology. We thought to a virtual world focused on business applications where people could interact and do business together as well as socialize and improve their network; everything without moving from the office. Our product was meant to be at the same time fully 3D-immersive, strongly multimedia oriented, and cool. We first made a technical JV with the Politecnico di Milano-Metid Center and after we entered into Politecnico incubator. The reason why we are at Pier38 with Mind The Bridge is that we want to think global: we'll soon relocate HyperFair headquarters in San Francisco, keeping the technical development in Italy. Our mission? To grow as much as possible, as quickly as possible. To this extent, no other place in the world is better than the Silicon Valley.